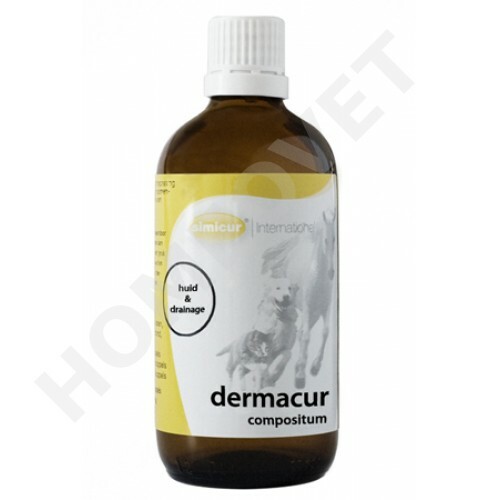 Dermacur is a homeopathic tincture in a 100 ml dropper bottle of SIMICUR for oral use in dogs, cats, horses and ponies. Application:Administered to the feed Dermacur ensures for optimal metabolism of the skin and therefore has a stimulating effect on the skin. 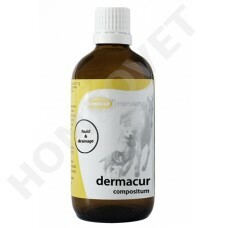 Dermacur stops scaly skin and prevents eczema-like skin reactions. Dermacur is applicable to poor skin function, itching, dry scaly skin, eczema and poorly healing wounds. At the same time Dermacur is a drainage means by which it ensures a better mix of blood and lymph. Dermacur deshal is entirely applicable as a tonic. Effect: Many skin diseases are eczema-like lesions caused by hypersensitivity. These reactions manifest themselves in Dandruff and itchy skin due to damage and inflammation caused by biting and scratching. Dermacur stops dandruff and prevents eczema-like skin reactions. Viola tricolor is effective for chronic skin diseases and pustules, nodules skin and acne. Urtica dioica is a diuretic and is especially important for skin rash that is associated with frequent and in allergic skin diseases. Juglans regia has a strongly bleeding and lymphereinigende effect that is particularly effective against chronic eczema and dandruff. Note: The entire complex of Dermacur gives a better mix of blood and lymph. Dermacur can therefore also be considered as a means of strengthening and general Dränierung success calibration and can be used as a cleaning agent in the spring.